This is our relaxing, no teacher retreat weekend! 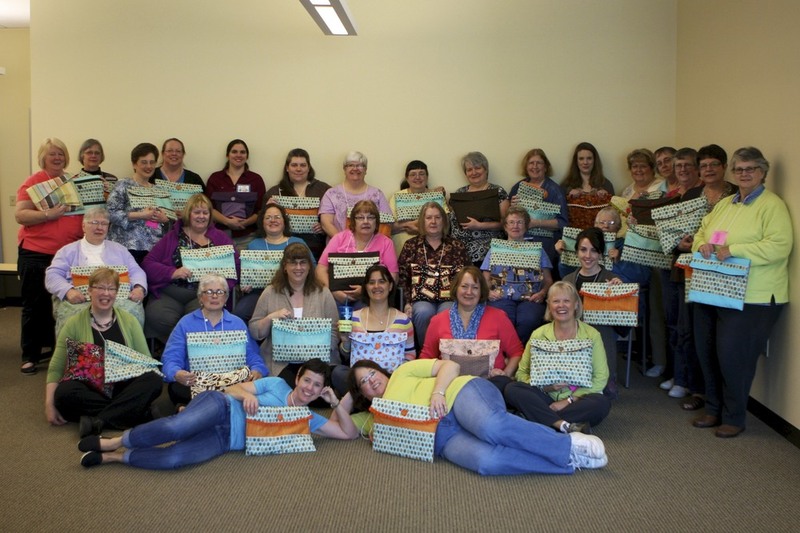 Bring a project, or 2 or 3 and your stitching tools and prepare to enjoy a weekend with friends. The fun starts Friday evening with an exclusive shopping night at Acorns & Threads. There will be a trunk show debut, prizes and other special shopping opportunities! We usually have an icebreaker voluntary exchange of some sort that's determined well enough before the weekend that everyone can be prepared. We have done scissor fob exchanges, ornaments exchanges and UFO exchanges at past Flings. Saturday and Sunday are relaxing days of stitching! We provide snacks, lunches, special projects, exclusive shopping events and lots of laughing. You'll have the opportunity to make new friends and reconnect with old ones. The Fling weekends are held at the Oregon Bar Association, which has a wonderful meeting room with comfy chairs, tables, a wall of windows and excellent parking, which is located just off the Carmen Drive exit of I5 in Tigard OR. There are several hotels in the area if you would like to make it a true retreat, and while we can make recommendations, hotel reservations are up to you. We do have goodies and presents during the weekend which follow our chosen theme, always a mystery to be revealed Friday evening or Saturday morning! It's lots of fun and a good opportunity to get lots of stitching done, although any counting mistakes due to laughter are not our fault!! Cost: $180 with a non-refundable $65 due at signup. In this introductory class you will learn the basics of hardanger including kloster blocks, needleweaving and cutting. Supplies are included but you will want to bring sharp embroidery scissors. The Queen's Sampler by The Needle's Prayse is an intermediate level reproduction band sampler (measuring 138 stitches by 382 stitches You will learn a variety of stitches including montenegrin and diagonal montenegrin stitch, spiral trellis stitch, bullion knot and buttonhole. Lynn will break the chart down into manageable sections so you will have no trouble completing the project. Cost: $145 (supplies not included). One Long Panel, by Laura J Perin Designs, is a delicate looking canvas piece offered in multiple colorways. It measures approx. 4 1/2" x 16" on 18 count canvas. It uses Watercolours, YLI ribbon Floss, Kreinik and DMC Pearl Cotton as well as beads. The second four month class will feature a companion piece (see below). This class is designed for a strong beginner level or higher. 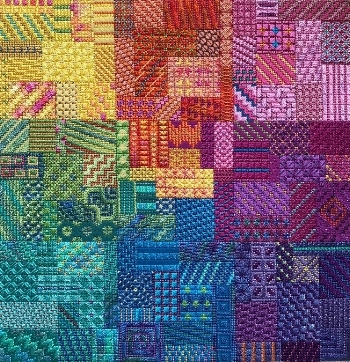 Colorblocks, by Needle Delights Originals is a rainbow-hued canvas piece. It measures 12" x 12" on 18 count canvas. You will have a great time learning a variety of stitches using many different fibers. You've all seen the adorable Fern Ridge scissor fobs, right? Now you can learn how to make them! Spend the afternoon learning basic 2-needle peyote stitch on this adorable heart design fob. Bring scissors, all other supplies are provided. In this class you will expand upon the basic 2-needle peyote stitch to create this elegant acorn scissor fob. While the beginning peyote class is recommended, it is not required to take this class. Bring your scissors, all other class supplies will be provided. During this fun finishing class, JoLyn will show you how to construct one of the adorable strawberries from the Erica Michaels Linen Berry Collection. You may pre-stitch one of the designs or bring a piece of material instead. The patterns and supplies are available at the shop. Next Scheduled Class: tbd - 10:30am - 1:00pm. Call or email the shop to register! Don't let specialty stitches intimidate you! 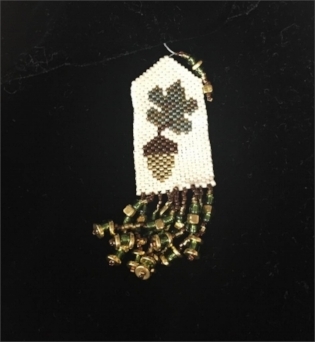 Learn all about Rhodes and Rice stitches featuring Mini Twist #2 designed by Northern Expressions Needlework. Class topics will include: selecting threads & beads for your project as well as each stitch needed for the chart. 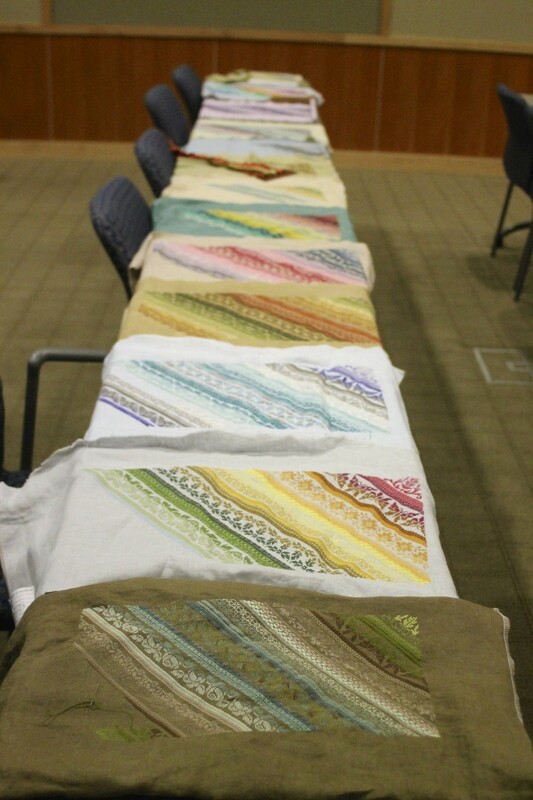 Printed stitch tutorials will also be provided for you to take home. Materials needed: Mini Twist #2 chart, 2 skeins of floss, 1 color of seed beads and a 9x9 piece of linen or evenweave. Materials can be purchased at Acorns & Threads at the class. Class size will be limited so each student receives personalized attention, so don't wait to claim your spot! Next Class Scheduled: tbd 1:00pm - 3:00pm. Call or email the shop to register! Don't let specialty stitches intimidate you! Learn all about Eyelets & Smyrnas in this 2 hour class, taught by Liz Westlake of StitchyBox, featuring Mini Twist #1 designed by Northern Expressions Needlework. Class topics will include: selecting threads & beads for your project as well as each stitch needed for the chart. Printed stitch tutorials will also be provided for you to take home. Materials needed: Mini Twist #1 chart (available from Acorns & Threads if you don't already own it), 2 skeins of floss, 1 color of seed beads and a 9x9 piece of linen or evenweave. Materials can be purchased at Acorns & Threads at the class. Class size will be limited so each student receives personalized attention, so don't wait to claim your spot! This 3 hour class is scheduled for a Sunday afternoon. 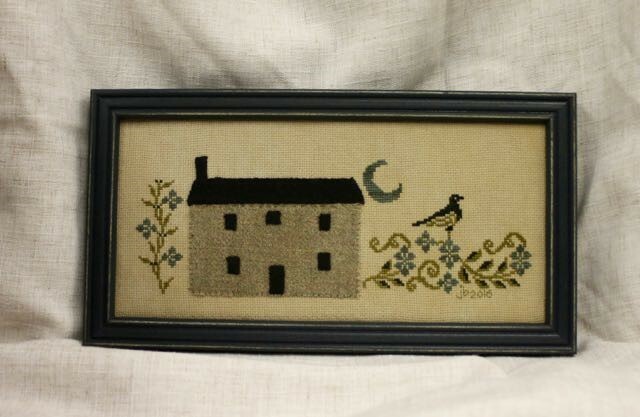 This class is a must for everyone who has ever cross stitched. You will review how to anchor threads, tie them off, learn 1/4 and 1/2 stitches, backstitching, proper hoops and needles, various kinds of threads and fabrics, etc. etc. You will also learn the technique of "over 2" or beginning linen. So many of the charts today are using this technique, we feel compelled to teach it to you in this class. It's the best three hours you will ever spend learning the basics of cross stitch. Next Scheduled Class: September 16, 2018 from 2pm - 5pm. Call or email the shop to register! Wool Appliqué is an easy way to adorn stitched projects. 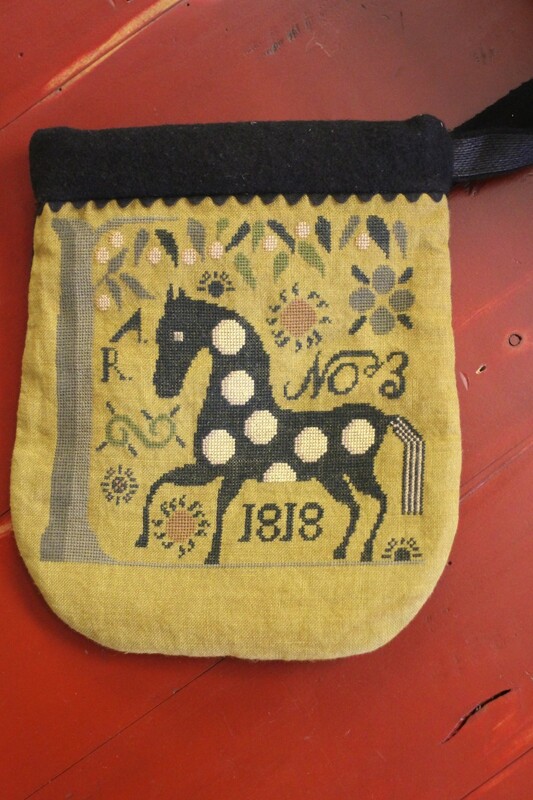 Just about anything that can be drawn can be appliqued using wool. Learn techniques such as fusible webbing, pinning, whip stitches, and blanket stitches. We’ll explore easy ways to make our project portable & easy to complete. Next Schedule Class: April 13 10:30am - 1:00pm Call or email the shop to register! These 2 hour classes are scheduled on a Saturday with an hour break for lunch, which is not included in the class cost. The block stand-up is so easy you will want to finish all of your projects using this method! In class we will complete your project in a block shape but when you learn the technique you can choose any shape. Students need to bring a finished project no bigger than 3" x 3" on a piece of fabric about 7" x 7". Students also need to bring 2 1/2 yards of wired ribbon (no wider than 1 1/2") and 1/3 yard of backing fabric., other supplies will be provided. Next Scheduled Class: TBD, from 10am - Noon. Call or email the shop to register! The button ornament is a quick and clever no sew finish to make small ornaments or even the cute scissor fobs to put on all of those scissors you possess. Not only will you construct this button ornament, you will learn to make basic cording and tassels to use as embellishments. You will need to complete a little design about 1-1/2" square on a 5" square of fabric. You will need one ball of #8 perle cotton or a skein of floss (for the cording and tassel) and a piece of coordinating backing fabric about 5" square. Next Scheduled Class: TBD, from 1pm - 3pm. Call or email the shop to register! Toccata Four, by The Drawn Thread, is a three band sampler in which each band can be stitched separately or put together as one sampler (as shown above). Measuring 214 x 286 when stitched as one piece, you will learn many different stitches as well as some pulled work. This sampler will be taught in three four month class segments, each segment covering a band. While the chart includes all three bands, you can choose to take one, two or all three of the segments. Cost per segment/band does not include supplies. 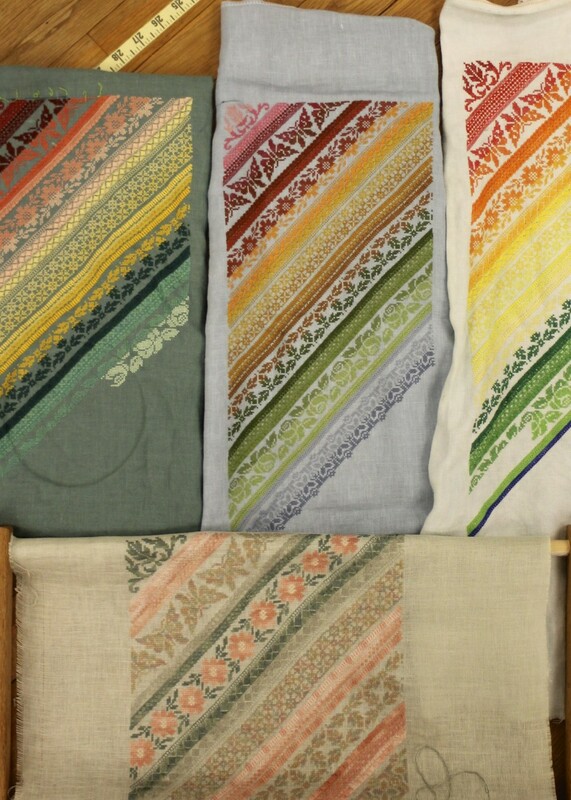 Not Quite Whitework by Northern Expressions is a twist on traditional whitework samplers since, while it does incorporate a variety of stitches, it does not have the cutwork of traditional whitework samplers. Measuring 393 x 249 stitches (22" x14" on 36 count), Lynn will break the chart down into manageable sections so you will have no trouble completing the project. Have fun playing with the fabric and thread colors to personalize it! Cost $145 (supplies not included). NOTE - This class is full! Pangea, by Threedles Designs, is a canvas piece offered in three colorways. It measures 14" x 6" on 18 point canvas. Lynn will walk you through this project designed for intermediate/advanced stitchers - working with you to explore a variety of thread types it incorporates, in addition to the variety of stitches you will learn. Cost: $145 teaching fee (supplies not included). Open to all sampler enthusiests! We meet once a month to talk about and stitch on samplers. Jeannine leads the group discussion, but everyone gets a chance to show off what they are working on! Sometimes we vote to do a group project, which everyone can interpret in their own color choices, or the time we did the design of our choice, using Gloriana bluegrass on Lakeside Vintage Autumn Gold! Open to all working on a design by Chatelaine - Martina Rosenberg. We meet once a month as a great way to make progress on that Mandala or smaller project! Open to all needlework enthuseists, with an emphasis on embroidery. JoLyn is here on the First Friday of the month to answer questions and help with your embroidery projects. Love Stacy Nash's designs? Or Lori Brechlin? Want help with finishing, or perhaps just want to meet other enthusiasts? This is the group for you! JoLyn will be assisting you as needed with all of your stitching/finishing questions. Cost: $5 per Friday (no sign up is needed).